At Merlo Waterfowl Company, we focus on professionalism, quality, and consistency. We have a long heritage of gunning in the heart of the Pacific Flyway. Our properties hold the highest concentration of waterfowl per acre in the world. We properly manage our hunting farms and never over shoot them. 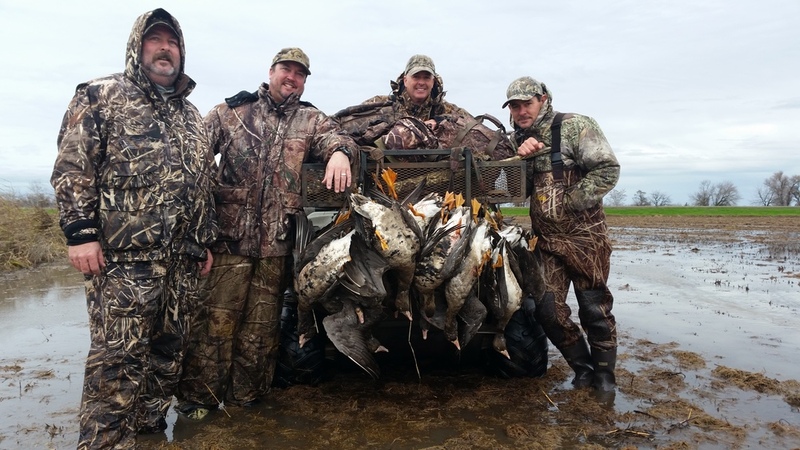 Weather you prefer to hunt from your own blind for the season or prefer a daily guide service, Merlo Waterfowl Company is the premier full service waterfowl outfitter in the Pacific Flyway. Our guides are personable, experienced, motivated and live to hunt waterfowl. Our fields and blinds are extensively managed throughout the season, routinely brushed and decoys managed by our field crew. We use only the best calls and gear on all of our hunts and when necessary use large spreads of the highest quality full body decoys and calling that put the birds in your face. Merlo Waterfowl Company brings to you over 80 years of waterfowling knowledge, experience, and heritage unparallel in the industry. All of the fields are scouted daily. Our duck pit blinds are located in “hot spots” of the field and are designed to hold up to 3 - 5 hunters and a guide. We prefer to hunt no more than three guns per blind to insure the most discriminative outing. All our fields are located in key proven, traffic patterns between feeding and resting. When dry field goose hunting, up to five to seven hunters and a guide hunt in well canceled layout blinds sitting in the midst of large numbers of full body motion decoys. Duck Hunts start with meeting the guide at about 1 ½ hour before shoot time. Hunters are taken to one of the several locations chosen for that mornings hunt and shuttled to and from the blind via ATV’s or a eight wheel argo. Sometimes an additional location is used if an unforeseen change in weather or bird traffic should occur. Goose Hunters will be given advanced notice to their time and meeting place based on the guides scouting for that days hunt. Bird Processing fees are not included in the price of the hunt. Merlo Waterfowl can provide bird processing at an additional fee. If you would like to clean your own birds at no charge, we can assist you with the storage until your departure. Multiple quality Hotels are only 10-15 miles from meeting locations. Merlo Waterfowl Company has preferred pricing at several of the Hotels in area for its clients. Please request upon booking your hunt a preferred pricing list. The Chico area lends itself to wide variety of food and entertainment. Whether it’s a prime New York steak or juicy burger, food seems to never be a problem with our clients. We are here to help satisfy whatever your cravings are, just ask. We can also arrange for a lodge style meal at our headquarters if you would like a quality home cooked meal. Sacramento International Airport is the closet commercial airport to our location. Driving time from Sacramento International Airport to our headquarters is approximately 1.5 hours and we are approximately 3 hours driving time from the greater bay area. Rental cars are available at the airport and or a pick up service can be arranged in advance of your booking time. Maps and directions can be found on our Contact Page.